THIS REMARKABLE book transcends the crucial limitations of both Marxist social theory and conventional anthropology by consciously avoiding "economism" and "culturism". While recognising "the independent transformative power of capitalism", Ram places "culture and sexuality at the centre of capitalist transformation and the new division of labour between men and women". It is in this theoretical perspective that she studies the Mukkuvars, a fishing community in the coastal belt of Tamil Nadu. At one level a critique of contemporary social theory, this highly readable book is a lively account of life within the community. The ethnography is detailed, the writing lucid. The chapterisation and chapter headings are somewhat cumbersome, partly because the author is groping with relatively unexplored areas like the interconnections between the labour process and sexuality/gender. The Mukkuvar fisherpeople, by not depending on caste Hindus for a living, sidestep an ascribed polluted status, and construct a relatively antonomous self-definition. Although they converted to Christianity in the 16th century, even today the Church's discourse is in conflict with the popular religion of the Mukkuvars. Ram analyses the community's popular religion as a field of value and action, within which the construction of femininity, female sexuality and the female body can be examined. For instance, while the Virgin Mary embodies the official version of the feminine, in practice the Mukkuvars believe as strongly in Eseki, the local Hindu goddess. Eseki embodies some of the "disorderly" and "unruly" elements that the indigenous culture recognises in women. The high incidence of female possession in the community is attributed to Eseki. In its own way, this is a form of resistance to cultural hegemony. When possessed, women "pour out their anger and mockery at Christian divinities... The Virgin Mary's serene composure is transformed by the demonic discourse into a kind of complacency. Women go running up to her pedestalled existence inside her shrine, and shake their fist at her, demand to know who she thinks she is, seated smugly and snugly behind the steel bars..." Culture is a field of conflict, and much of the struggle coalesces around contradictory, discursive representations of femininity. Possessed women play with, invert, and mock the cultural construction of femininity. The apprehension of women as basically uncontrollable, powerful and dangerous, can be linked to gender roles among the Mukkuvars. Though barred from the central productive role in the economy, women control the cash flow from that production. They take economic decisions and control the household budget. Despite the fluctuations and uncertainties of the male-dominated occupation of fishing, women keep the domestic unit afloat, sustaining it on a daily basis. Especially important is the "underground female economy" of credit networks that women set up, in which loans are generated on the basis of ties (of kinship, neighbourhood, work and friendship) between women. New systems Transformations in the political economy of fishing have meant different things to different people. Ram examines the structural forces at work, and the experiences of Mukkuvar women and men. While men now migrate seasonally for work to the new centres of mechanised farming, women stay behind in the village. As a consequence of the new spatial arrangements and systems of transaction, women's centrality in the sphere of finance and credit is seriously threatened. Drawing out differential implications of the changes in production relations for women and for men, Ram notes that the process of sexual differentiation is "always at the heart of the old as well as the newly emergent relations of production." Briefly, she examines the implications of this analysis for political mobilisation. The region's fisherpeople have been getting together to protest against mechanised fishing, drawing attention to its harmful impact upon the ecology and the livelihood of thousands of small-scale, artisanal producers. The implication, as Ram spells out, is that those groups of women who are culturally validated in their work have been far more receptive to political mobilisation than those "whom the culture confines, restricts, or else ignores altogether." Women, "as mothers, wives and caretakers of the local environment", have participated in many campaigns. So have the few Mukkuvar girls who availed of higher education. In contrast, young, female, home-based, piece-rate workers have hardly had access to organisations. 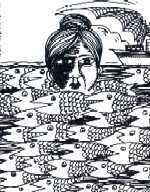 Nor have women fish-traders responded to attempts at political mobilisation. Deepti Priya is a research scholar at the Department of Political Science in Delhi University.